You know you want to keep your new little one as close to you as possible, especially throughout the nights, but you also want to ensure she is as safe as possible. You have learned about co-sleeping cribs, but you’re not sure which one will be best. Well, if you are looking for something constructed with top-notch quality and safety, but that is still stylish yet practical, the 3 in 1 SnuzPod Bedside Crib might be the best choice for you and your bundle of joy! This 3 in 1 bedside sleeper crib is an excellent, high-quality choice for anyone looking for a co-sleeper crib for their newborn or young baby. First of all, it is excellent at being our favorite thing – a bedside co-sleeper, allowing you to see and be seen by your baby all throughout the night through the first 6 months of life while providing a baby-safe space for better, safer sleep. Its see-through mesh wall can be zipped down to allow you access to reach out and soothe your baby and for easy nursing as well. It is, in essence, everything we love about co-sleepers. But the SnuzPod has some really great, unique features as well. 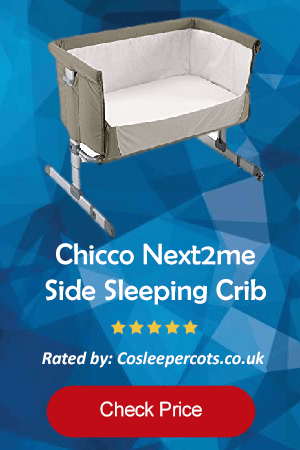 It is “3 in 1” because it can be used as a bedside co-sleeper with its zippable wall that can be lowered to give you instant access to soothe and feed your baby; it can also be used as a traditional stand-alone crib; finally, the sleeping pod can be detached from the stand to become a separate moses basket or travel bassinette that can easily be located elsewhere in the home or taken on trips. 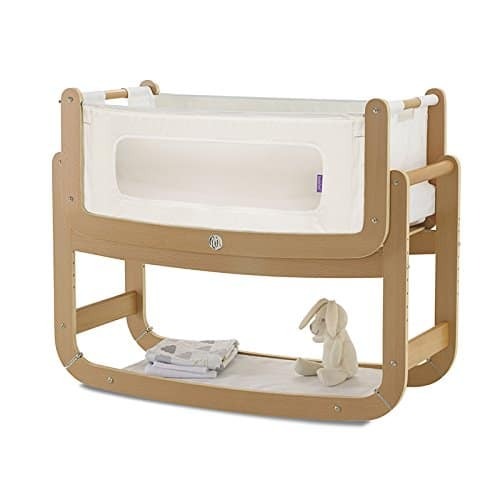 It has a number of very unique features, such as its wooden, rockable frame that will allow you to rock baby to sleep, the storage shelf underneath, and the detachable, rockable bassinette. Despite its wooden and solid frame, it is still in fact height adjustable, with seven different height settings ranging from 37-58 cm, ensuring that you will be able to get baby’s mattress to match the height of your own. It is very versatile, as should already be evident, and can keep your baby resting peacefully from newborn until 6 months of age, or when baby learns to sit up. This is much longer than most moses baskets can last. And, because it can work as a standalone crib, when you and baby are both ready, you can slowly transition from using the crib side feature to moving the crib away from your bed and eventually into baby’s own room. Finally, among baby side sleepers, it is one of the most stylish ones you can find and comes in colors that can go with any room decor. You will be able to get fashionable along with practical in this sleep solution!